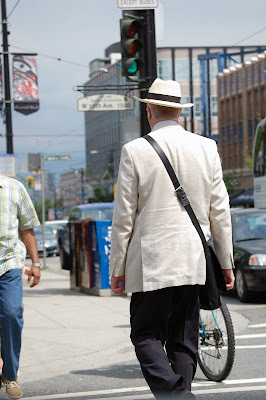 Beyond Boston Chic: The fedora comeback...again? !...Vancouver, B.C. 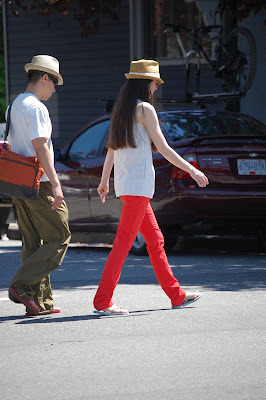 I have many more pictures as back-up, but fedoras were everywhere in Vancouver and in Seattle. The young, the old, females and males sported them. Can't say I'll be buying me one, but it does add a bit of panache to an outfit. I love your blog and am continually amazed at how readily random people pose for you on the street. Though having grown up in the Pacific Northwest and endured grunge and the swing fad, I have to make one small correction. The first picture is a fedora (I used to sport one myself), but the latter two are closer to pork pie hats.